North Korean leader Kim Jong Un meets with the delegation that had visited the United States, in Pyongyang, in this photo released by North Korea's Korean Central News Agency, Jan. 23, 2019. 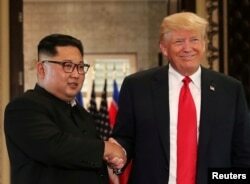 North Korea's Kim Jong Un has expressed "great satisfaction" after receiving a letter from U.S. President Donald Trump ahead of a second summit between the two leaders, Pyongyang's state media reported Thursday. Kim is making "good technical preparations" for the meeting, the official KCNA news agency said, in the isolated nation's first comments on the talks scheduled for next month. The letter was handed to Kim by one of his right-hand men, Vice Chairman Kim Yong Chol, who met Trump at the White House last week as the two countries seek a denuclearization accord that could ease decades of hostility. "[Kim] spoke highly of President Trump for expressing his unusual determination and will for the settlement of the issue with a great interest in the second DPRK-U.S. summit," KCNA said, referring to the North by its official initialism. The strongman said North Korea will "believe in the positive way of thinking of President Trump" as the countries advance "step by step" toward their goals, the agency added. On Saturday, Trump said a location for the summit has been decided, without giving more details. However, a Vietnamese government source told AFP "logistical preparations" were under way to host the encounter, most likely in the capital, Hanoi, or coastal city of Danang. The White House has confirmed the summit will go ahead in February. FILE - U.S. President Donald Trump and North Korean leader Kim Jong Un shake hands after signing documents during a summit at the Capella Hotel on the resort island of Sentosa, Singapore, June 12, 2018. The pair first met in June in Singapore, where they signed a vaguely worded document in which Kim pledged to work toward the "denuclearization of the Korean Peninsula." But progress stalled soon afterward as Pyongyang and Washington — which stations 28,500 troops in South Korea — disagree over what that means. The United States expects Pyongyang to give up its nuclear arsenal, doggedly built by the Kim dynasty despite sanctions and nationwide famines. Kim, whose family has brutally ruled North Korea for three generations, is seeking guarantees of the regime's survival as well as relief from biting U.N. sanctions. Analysts say that a second summit has to make tangible progress on the issue of Pyongyang's nuclear weapons if it is to avoid being dismissed as "reality TV."